Look 20 years younger within 3 days of use - rid those wrinkles from the inside out! Decrease calorie intake - just 2 spoonfuls for 3 days* reverses all other calories! Enjoy your cake and eat it. Up to 283% increase in visual acuity at night - no need to rely on torches or risk flat batteries when out walking. Testers also reported an increased sense of humour, a more shiny coat, and many other fantastic benefits! 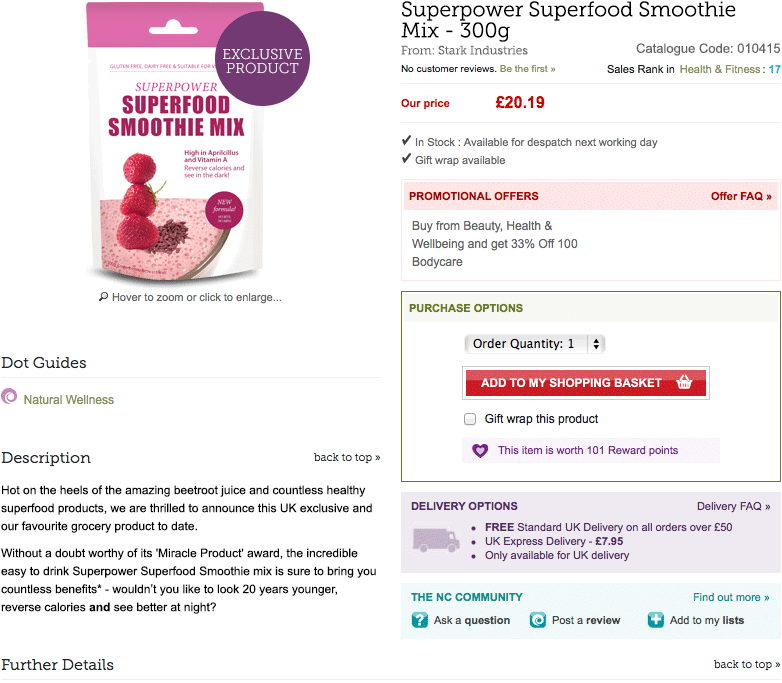 Yes, you too can see in the dark, reverse calories and even laugh more with the Superpowder Superfood Smoothie mix. Try the taste sensation that Tony Stark himself called 'an innovation in achievable superpowers'! 300g tub with serving scoop. 100% recyclable packaging. Gluten free, dairy free and suitable for vegetarians. Aprilcillus plantarum, Bifidofoolerium lactis, natural beeswax, extracts of rosehip & cayenne, burdock root, Freeze dried beetroot greens, stabilised rice bran, Fibbooligosaccharides, soya lecithin (non GM). *Side effects may include: slight telling of porkies, excess flatulence, unexplained attraction to chocolate cake and Robert Downey Jr, and in rare to most cases a mild inability to see in the dark.